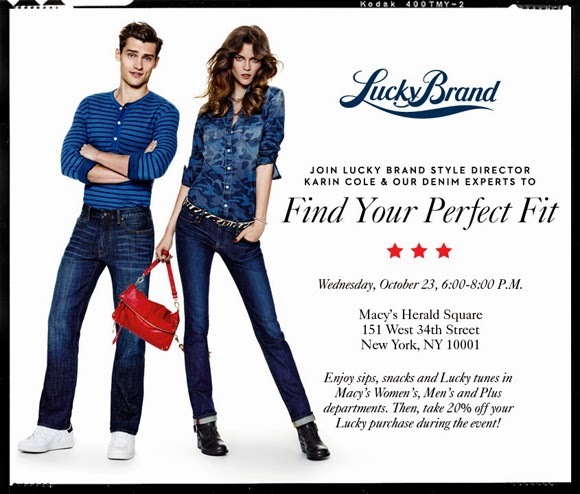 Find your perfect Lucky Brand fit tomorrow evening at Macy's Herald Square, and get 20% off your Lucky purchase during the event. A few weeks ago I tried on a pair of Lucky Brand jeans from their Made in America line and fell in love. They're just a little more expensive but well worth it, as the fit was fantastic. No saggy nothing, and I could have worn them to bed to sleep in, they were so comfortable. Look for the sign below and try on a pair tomorrow.